Scottsdale, AZ, April 27, 2018 — Hubitat, Inc. has just unveiled a new home automation platform designed to run 100% locally, greatly improving reliability compared to the cloud-dependent hubs currently on the market. The local approach to home automation also delivers faster device response and keeps personal data secure. Hubitat Elevation is a robust platform that automates your smart devices and elevates your home. It’s a different approach to home automation, providing a 100% local solution. Eliminating cloud dependence means that consistent Internet access is no longer a requirement in order for your device automations to function reliably. Commands are sent directly from hub to device, so response is fast. All automation processing is done on your local area network (LAN), so your device data is stored on your LAN and kept securely at home. 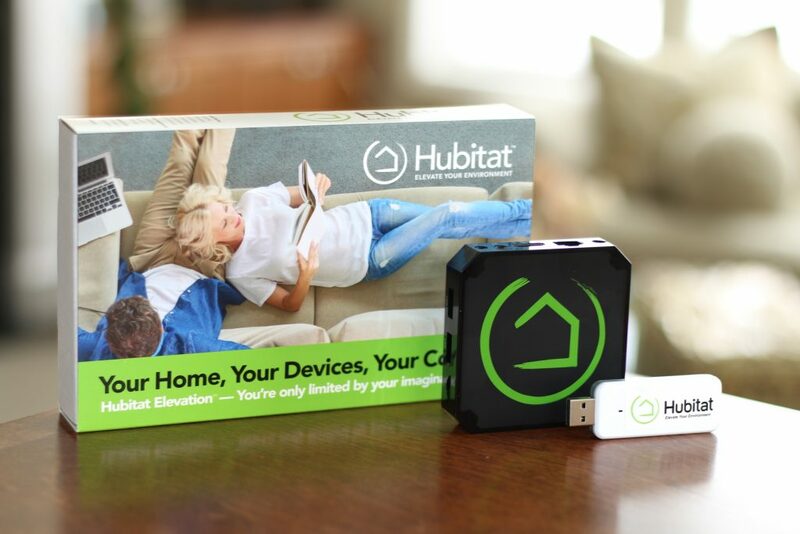 Hubitat Elevation empowers the DIYer to automate (and elevate) his or her home such that all the connected devices work reliably, instantly and without putting personal data at risk. Home automation hubs are designed to control and automate your home’s many smart devices such as lighting, audio, security, detection/sensors and climate control. Almost all “smart hubs” currently available for DIY-enthusiasts process automations in the cloud, which introduces issues with reliability, speed, and security. · Reliability. Cloud dependence impacts availability. Connected devices throughout your home require consistent Internet access in order to function — an Internet outage means automated devices simply can’t work. · Speed. Cloud-based processing causes delays. Users must wait as each command is sent to the cloud and back before the device receives the command and functions. That round trip takes time and is further exacerbated if Internet latency issues exist. Eliminating that round trip means automations are very fast. · Security. Cloud transactions expose personal data. Users of popular automation hubs have been craving a solution that overcomes these three drawbacks. Hubitat Elevation is the first solution that addresses these challenges by operating locally. Hubitat Elevation has built-in support for more than 90 unique smart devices, and more are being added with each update release. Support of the Z-Wave and Zigbee protocols allow the hub to “talk to” and automate the functions and features of standards-compatible devices. It also fully integrates with Lutron lighting systems, including RadioRA2, RA2 Select and Caséta, including the Pico remote. Hubitat Elevation supports numerous popular platform integrations including Hue Bridge, Amazon Echo, IFTTT, Sonos and soon Google Home, Nest and others. It comes with more than a dozen built-in applications to create and manage automations, including Rule MachineTM, Hubitat Safety Monitor, Simple Lighting, Mode Manager and the Hubitat Dashboard. 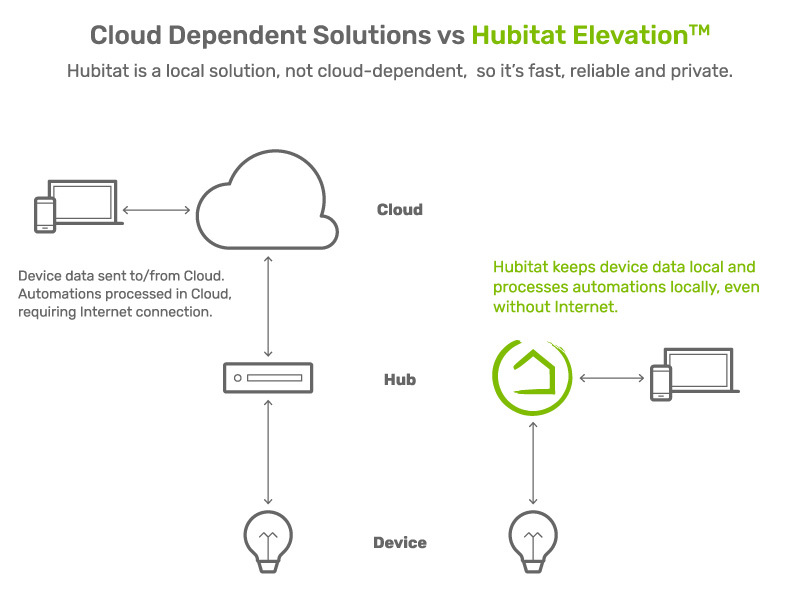 Hubitat also supports the easy migration of existing home automation systems from older cloud-based systems, including SmartThings, to the solid and reliable local processing of Hubitat Elevation. Many users of Hubitat Elevation participate actively in the Hubitat Community at https://community.hubitat.com/. They share experiences, learn from each other, and get inspiration, ideas and answers to their questions. 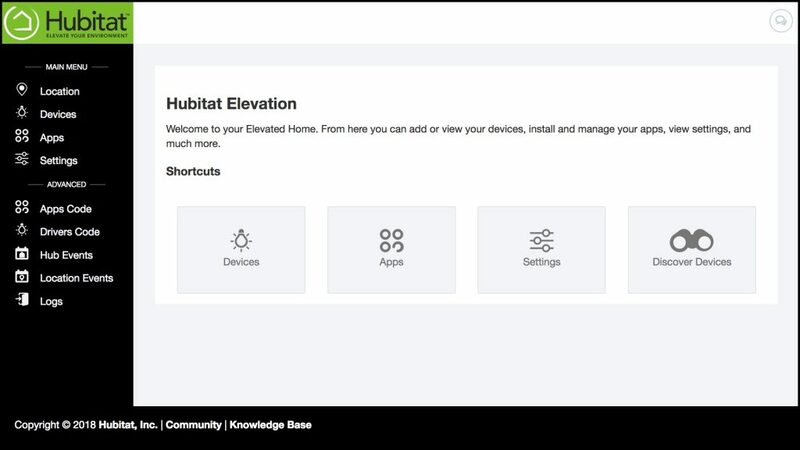 Video tutorials at https://hubitat.com/blogs/tutorials/ help both beginning and advanced users make the most of their Hubitat Elevation. Hubitat Elevation began shipping in January and is available to order at https://hubitat.com/products. The introductory price of the U.S. version is $99.95 (regular price is $149.95) plus shipping. UK/Ireland and EU versions are also available today at an introductory price of $139.95USD plus shipping. · Visit the Hubitat web site and download Hubitat Elevation datasheet & product photos. · Read Hubitat Blogs, i.e., “Home Automation: Local vs Cloud-Dependence”, and much more. · Device automations should function with rock-solid reliability, even when the internet is up and down. · Device response should be instantaneous, not with the latency that comes with cloud-based systems. · Personal data should be kept securely at home, not stored in the cloud, or even sent to the cloud. Theresa Marcroft, CMO, Hubitat Inc.